Skimpy excursus of dubious scholarship mining the writer’s early and fairly forgettable college romance with a midwestern rich girl. Fitzgerald’s later assertion that authors “have two or three great and moving experiences in our lives” and then hone their craft to repeat them “in a new disguise” is taken quite literally by West (English/Penn State; William Styron, 1998). 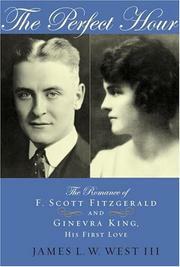 A hundred pages—the rest is padding: diary entries, early short stories, letters, etc.—argue that Fitzgerald’s 1915 encounter with flirtatious visiting teenager Ginevra King at a party in his hometown of St. Paul, Minnesota, was the definitive experience for Scott. West asserts, oxymoronically, that the two young people began an “intense romance, largely epistolary.” Scott was floundering at Princeton, she lived in Lake Forest, Illinois, so they rarely saw each other, save at football games. Though Ginevra’s letters recently came to light, along with her diary from these years, Scott’s were destroyed at his urging. Ginevra’s letters and diary entries contain mostly hormonal squeals—“Scott perfectly darling. Am dipped about”—but are occasionally revealing. “When you said I hadn’t any character,” she writes. “I consider that a personal insult.” West’s attempt to prove that their romance “was much more than a shallow flirtation” rests on the evidence of Scott’s subsequent female characters, pretty, fast, and vapid young women who bore equal resemblance to his wife Zelda or any of the Jazz Age girls he met in their circle. Yet, West asserts, Ginevra was important because her memory provided the budding writer with a device to evoke memories of loss and regret, and because the early recognition that as a poor boy he could never marry a rich girl like her sharpened his role as the “outsider.” It’s all a bit hazy and presumptuous, and the inclusion of an appendix delineating “Other Ginevras” in history (e.g., Leonardo’s portrait of Ginevra de Benci) truly outrageous. Romantic mulch for the lay reader.